Continually rethinking our actions, redefining our roles and re-examining our impact on society is why volunteers continue to be the driving force of AFS. We volunteer for AFS knowing that it was founded on the notion that war is not the same as the lack of peace. And that peace is disturbed by conflicts that are, most of the time, based on intolerance and lack of understanding. The transition from rescuing people on the battlefields to providing intercultural learning programs allowed AFS to work for peace in a different way: spreading tolerance, empathy and understanding between different cultures. Since these topics can be deeply personal and subjective, one of the significant challenges for AFS volunteers is making them tangible, not only for the exchange students and families participating in our study abroad programs, but also for the community at large. 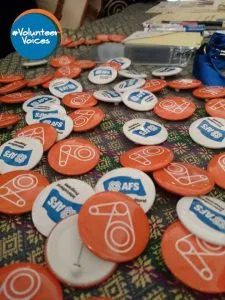 During the AFS Youth Volunteer Forum held in Argentina in April 2015, a group of volunteers worked on recommendations to increase the social impact of AFS. This Forum was inspired by the 100 Years Young! AFS Youth Workshop & Symposium held as part of the AFS Centennial Celebrations in Paris, France in November 2014. AFS volunteers want to combine actions with like-minded organizations that understand the community’s background, problems and needs. By strengthening our relationships within local communities, AFS volunteers could be even more effective by using our expertise in the theory and practice of intercultural learning and global citizenship education, as well as constructive experiences in collaborative projects. Since April, several Forum participants have already launched successful social impact projects. One initiative is #VolunteerVoices, a platform to create social impact and awareness by sharing stories of AFSers and AFS volunteers — what we do, how we feel, what we think about the world around us. VolunteerVoices’s International Peace Day campaign (September 21, 2015) created a space for volunteers to share their thoughts about peace by answering the question: What does peace mean to you? AFS volunteers were joined by AFS staff, exchange students and host families, as well as people from other organizations in this this peace awareness campaign. To learn more about the conversation, search the hashtag #PeaceIn2015 on social media or our visit the AFS Volunteer Voices page on Facebook. , taking action to create a more just, sustainable and peaceful world. Volunteers in Turkey are creating innovative projects to reach new communities and bring intercultural learning opportunities to remote parts of the country. They prepared a short-term exchange for eleven students from Hakkari, a remote town in the east of Turkey, to visit Izmir. The students were placed with local families and attend workshops especially designed for them, they went on cultural visits and took part in daily life, which has inspired them to apply for more extensive and immersive intercultural experiences outside their country. Find out more about the Hakkari project in the AFS Volunteers Awarded for Changemaking Initiatives article in this issue of Connect. Peace continues to be a hot and necessary topic worldwide. It’s a conversation and movement that all AFSers should join. All AFSers and global citizens should feel empowered to create the change they would like to see around them. The good news is that we have a great opportunity to generate positive social impact by increasing understanding and tolerance through AFS intercultural programs, and social projects locally and globally in cooperation with other organizations. VolunteerVoices encourages all AFSers to: Be the change you want to see in the world! Written by Simón Rodríguez, volunteer of AFS Venezuela and Ricardo Furtado Pereira, volunteer of AFS Brazil. Originally published in Connect: Intercultural Insights for Global Citizens — curated by AFS Intercultural Programs.